My next venture was long-standing open-mic night Spoken Word at Au Chat Noir, a typically grungey and grafittied bar in Belleville, the old working class district which is now, with Oberkampf, the height of hip. Spoken Word describes itself as a home for “creatives and lost anglophones”. The majority of open-micers are American and the flavour tends to be quite young, political, stream of consciousness style readings. The emphasis tends to be much more on performance than it is in the UK. One of the featured artists was Jennifer Blowdryer, who used to head up a punk band in New York in the 70s. She was great fun, belting out songs and reading an essay about Eva and Zsa Zsa Gabor from her new book. The venue was an atmospheric basement space, with the calmest member of the audience by far being a short-eared rabbit who surveyed all that went on with a buddha-like tranquillity. 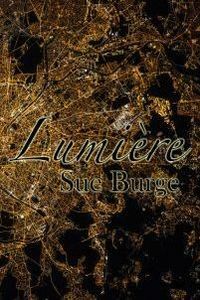 I read a couple of poems from Lumière to spread the word as it was thanks to my 2016 Arts Council funded residency in Paris that this pamphlet, a tribute to Paris’ cinematic heritage, came into being. For my third and final exploration I went back to Culture Rapide, another grungey, graffitied bar in Belleville where I had read embryonic Lumière poems back in May 2016. This meant I wasn’t heckled onto stage with cries of “Virgin! Virgin!” like other terrified newbies. My slot followed Gertrude, a fabulous French transvestite who sang a song about working girls in Montmartre, resplendent in fishnets, beret and little black skirt. And following me was the ubiquitous Jenny Blowdryer! The featured act was Abdel Kader Wawi, aka 5919, a Lebanese calligraffiti artist. The stage became an art studio as old film posters were stuck up and then covered with the most beautifully executed Arabic calligraphy of words suggested by the audience. While he worked, two friends played guitar and sang, giving the performance a gypsyish/Moorish slant. All three experiences were extraordinary and I felt privileged to have been a fleeting part of them. I did, of course, venture outside and went on long, sunlit walks on most days, sometimes clocking up around 10km in a go, but a further two highlights were both part of the thriving cabaret scene in Paris. 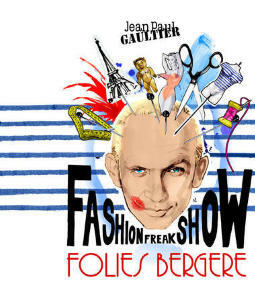 It was Paris fashion week and I decided the only way to properly celebrate this was to go along to the Folies Bergère and see Jean-Paul Gaulthier’s Fashion Freak Show – a cabaret spectacular which he had created to showcase his life in fashion, like peeking into his private diary. Looking back, I don’t know how I managed to get a ticket as both Marion Cotillard and Paloma Faith were in the audience, along with other celebrities who I had no hope of identifying and a plethora of gorgeous men and women who all seemed to have modelled for J-P. The show was fantastic, full-on dancing, electrifying music (chosen by Nile Rodgers), fashion shows featuring Gaulthier’s iconic confections and some brilliant projections including images of the young J-P watching Falbalas, the 1945 film which was one of his earliest inspirations. The film starred the gorgeous Micheline Presle as a woman seduced by a Parisian designer. One of the highlights of the show for me was to see Presle in the huge on-stage projections, playing Gaulthier’s influential grandmother. 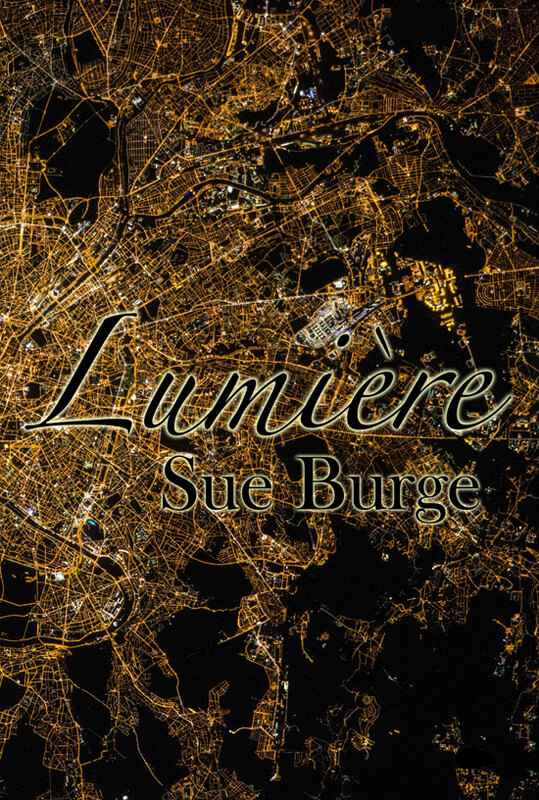 In one of those strange coincidences that makes life the colourful pageant that it is, I had a drink later in the week with my friend Juliette, who runs the fabulous Cine-Balade company and whose walks were hugely inspirational when it came to writing Lumière. She had just interviewed Presle as she works for an organisation which restores old black and white films and one of Presle’s is hopefully slated for re-release. Juliette had also worked with the team restoring Rue des Cascades which was one of the many films I managed to see while in Paris. This 1964 classic is a little reminiscent of Les Quatre Cents Coups, very much seen from a child’s point of view and set in the Belleville/Menilmontant area. It focuses on a boy’s reaction to his mother’s new boyfriend, who just happens to be black. The second cabaret experience, a visit to the Lapin Agile, is probably one of my all-time favourite Parisian experiences in the 40 years since I’ve been coming to the city. You need to be able to understand French pretty well to really appreciate it, but just to go in and imbibe the atmosphere is worth the ticket price. It’s a famous Montmartre cabaret dating from the 19th century. It was bought by Aristide Bruant, comedian and cabaret singer, in the early 20th century to save it from demolition. 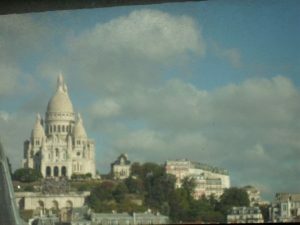 It became a favourite spot for struggling artists and writers including Utrillo, Picasso, Apollinaire and Modigliani. It also became famous for launching unknown musicians and singers on to greater things – singers like Georges Brassens and Claude Nougaro. The evening starts with five or six singers and musicians around a table singing together, the songs are all French in origin and some date back to the fifteenth century. Each musician has a solo turn, maybe with an accordion, a piano, a guitar. There are songs by Piaf, Brassens, Bécaud and many more including Charles Aznavour, who, in his youth, lived just below Montmartre in the 9th arrondissement and who died very recently at the age of 94. 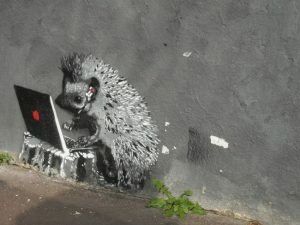 The venue is dark, atmospheric, with old wooden tables and benches and paintings on every inch of wall space, including a copy of Picasso’s famous Au Lapin Agile. Living in Cromer can have quite surreal aspects at times. In May we had the plague of hairy caterpillars (oak precessionary moths). These were all over the concrete prom and as their hairs are toxic there was a bit of a panic locally. The plague also delayed the arrival of the Bagot Goats for their annual summer holiday. 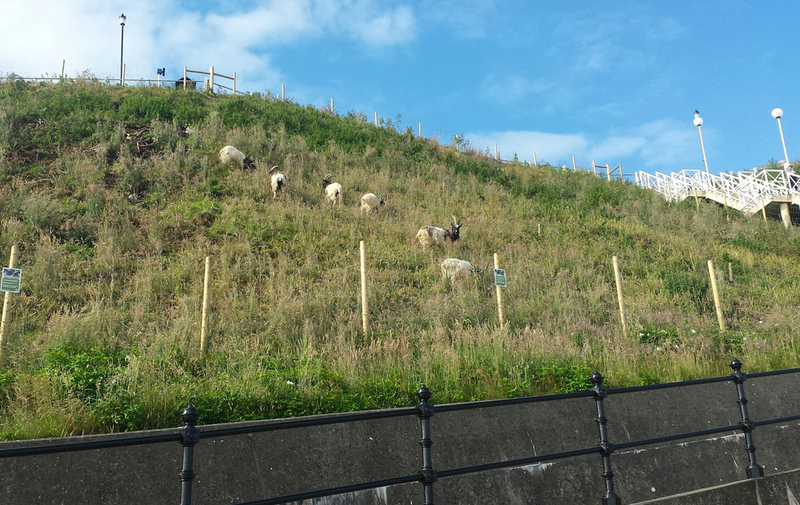 The herd belongs to North Norfolk District Council and they come to graze on the Cliffside above the promenade. They probably don’t know it, but they are carrying out an important role in habitat management. Bagot goats are our oldest British breed, hardy, tame and fond of uplands. This year there are 10 nannies and 9 kids and they are a sight to behold, although I have to say that most of the time they appear to be having a good rest on their sandy ledge. Except on Fridays. This is when I get up early to do Yoga on the Pier at 7am and the goats are usually already chomping away as I blear my way past. I’ve been doing yoga for over thirty years but this has to be the best class ever – doing downward dog and seeing the sea lap under the boards of the Pier is a unique experience! I’m a great fan of paddling when it’s too cold to wild swim and sometimes just pop on my teva sandals and paddle to the class. For as long as I can remember Chris and I have been popping to seaside places after work for a spot of paddling and ice-cream (these go together like fish and chips, bread and butter etc etc) usually Sheringham when we lived in Norwich as it was one of the few seaside towns to sell Ronaldo ice cream, and Hunstanton when we lived in King’s Lynn. This week I paddled from East Runton to Cromer to a morning appointment and arrived sandy but refreshed. Wet commuting is not unusual, I once did a day-trip to Basel to visit the Tinguely Museum and saw an extraordinary number of people swimming to work, or rather floating, letting the strong current take them downriver, office clothes firmly secured in inflatable drybags! During my time teaching in Switzerland I regularly swam in Lake Zurich, often morning and evening, to wake up and then wind down. You always knew when you had swum to the middle of the Lake as two distinctive church towers suddenly merged into one, a little like an eclipse. In the summer there’s a lovely ladies only pool on the River Limmat which turns into the Barfussbar (Barefoot Bar) once it gets dark. In July we headed off to Ledbury for the Poetry Festival and some hillwalking. It coincided with the first week of the heatwave and I found myself longing for cool coastal breezes. In search of respite we paddled in the Wye a couple of times, once just outside Hay-on-Wye and once in Hereford where I suddenly twigged why the town is situated there and why the water is so shallow (it’s all in the name!). 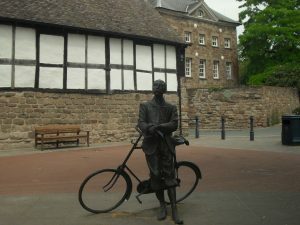 Elgar is associated with this area and it’s hard not to walk around without his wonderful music playing through your mind, especially as many of the friends he based Enigma Variations on lived in this area. There’s even a statue by the River Wye commemorating Dan the Bulldog, who belonged to George Sinclair and inspired Elgar’s Variation on an Original Theme XI which tells the story of Dan falling into the River, paddling upstream to find an easy way out of the river and his triumphant bark as he reaches dry land! 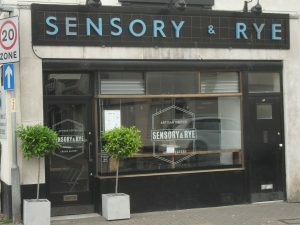 Sensory and Rye in Union Street provided us with much-needed third wave coffee (V60) and a delicious vegan lunch. The unusual name comes from a part anagram of the name of the butcher’s shop originally on the premises (G Rowberry and Sons). A choir were practising in Hereford Cathedral during our visit, their sublime voices filling the space and enhancing the discovery of Tom Denny’s extraordinary stained glass windows celebrating the life of Thomas Traherne, a contemporary of John Donne, and one of the metaphysical poets. The detail and colours were unlike anything I’d seen before. In pursuit of all things watery we did a Wells and Springs self-guided walk in the Malvern Hills. The start point was one of my favourite and most unusually sited vegetarian cafes at St Ann’s Well. It’s a steep climb but the reward of chocolate fudge cake is nothing if not motivating! 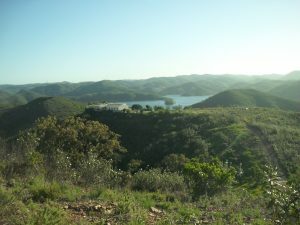 The drought was starting to have an impact, with yellowing grass and bare patches on the hillsides, but underground there are a multitude of springs. Malvern was very popular in the Victorian era when the health craze of “taking the waters” was at its peak. The local water was bottled by Schweppes from 1851 until very recently. Florence Nightingale, Lord Tennyson and Charles Darwin all took the waters and claimed considerable health benefits from this experience. Wherever the springs emerge above ground you’ll find a small well, often built by philanthropists to ensure poorer people had a good supply of fresh water. Below is the charming Westminster Bank Well just above West Malvern where, in St James’ churchyard lies the grave of M. Roget of Thesaurus fame. 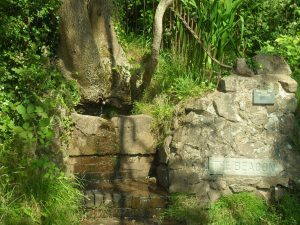 You can drink from the wells in Great Malvern itself but the hillside wells often become contaminated so I resorted to soaking my baseball cap in each one we passed instead of drinking. My hair and cap dried in minutes in the 30 degree heat. Tolkein and C S Lewis are strongly associated with Great Malvern. They often came up from Oxford to walk in the Malvern Hills with their friend George Sayer, and would drink in the Unicorn Pub. 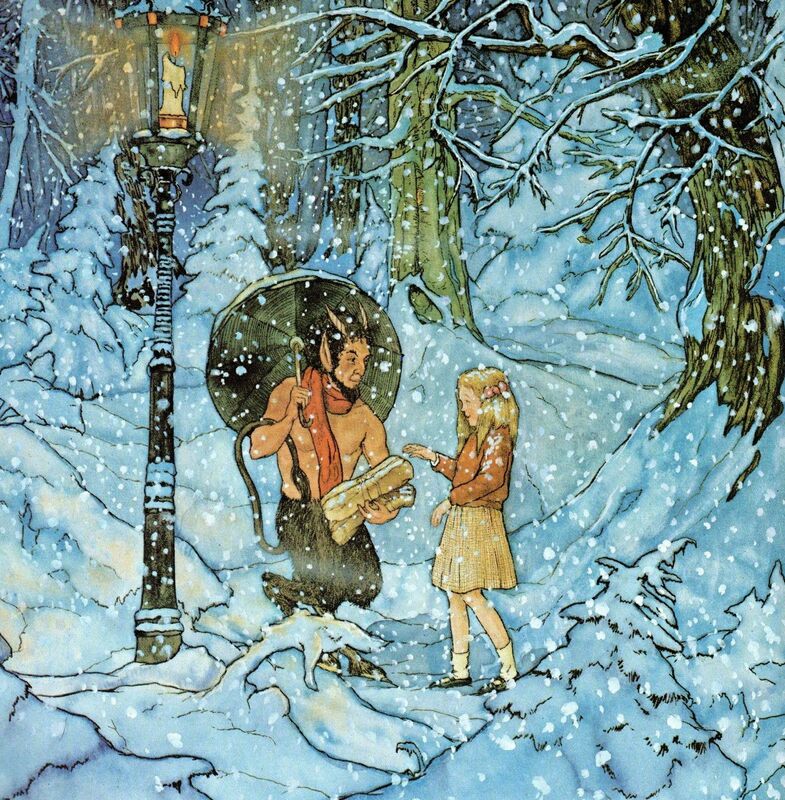 There are some gorgeous Victorian gas lamps in the town and the hills, often in quite incongruous places, and it’s believed that this is where C S Lewis got the idea for the lamp-post in Narnia where Lucy meets Mr Tumnus. The hills are also thought to be the inspiration for aspects of Middle Earth and the landscape of Narnia. I really enjoy films which explore the lives of writers and Shadowlands is a particular favourite. Anthony Hopkins plays C S Lewis and Debra Winger plays Joy Davidson, the American poet he falls in love with. Her death from cancer challenges his Christian faith and it’s a powerful and moving film. The Happy Prince, which has just been released, explores fellow Irishman Oscar Wilde’s fall from grace and his days of exile in Paris. Rupert Everett is superb as the ageing Oscar, as one critic put it, he was born to be Wilde! I’m also fond of Zinnemann’s Julia with Jane Fonda as Lillian Hellman, Jason Robards as Dashiell Hammett and Winterton on the Norfolk coast standing in as Cape Cod. Ledbury Poetry Festival was a wonderful event to have on your doorstep as part of a walking holiday. 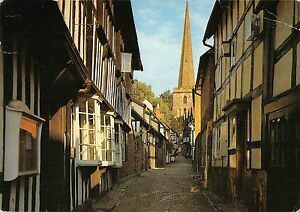 Ledbury is a very attractive market town and one of its many claims to fame is that John Masefield was born there – there’s still a firm of solicitors in town bearing that name. Elizabeth Barrett-Browning lived just outside Ledbury so it certainly has poetic form! The Festival takes place all over town; highlights were a storming performance by Hollie McNish, a superb reading by Sinead Morrissey, an insightful talk by Sarah Churchwell on Sylvia Plath and a brilliant analysis of Wallace Stevens by one of my poetry heroes, Mark Doty. I attended two excellent workshops, one with Sinead Morrissey on the perils of abstraction and one with Kim Moore on hidden narratives. 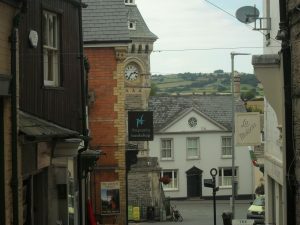 Almost every shop window was festooned with poems and poetry books but of course Ledbury can’t compete with Hay-on-Wye which has a population of 1500 and over 30 independent bookshops! So, what are your perfect holiday ingredients? 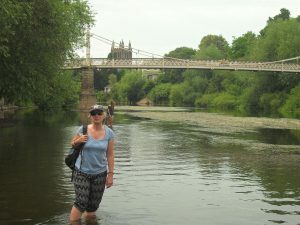 A simple combination of paddling, bookshops, specialist coffee, good walks and poetry certainly worked for me this time! 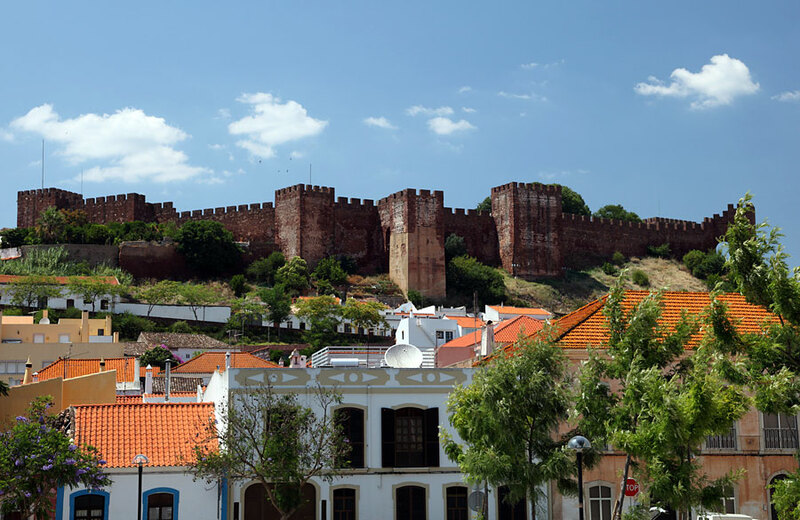 From 700-1200 AD Silves was a Moorish stronghold and the remnants of the city walls these days are proving very popular with nesting storks. 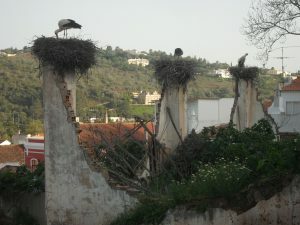 The storks were a joy, the most spectacular nest was the one on the old Communist Party HQ complete with hungry storklet and I absolutely fell in love with the series of nests on the ruined pillars of a house down from the Café Ingles. 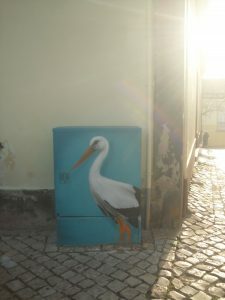 One afternoon I sat by the river and counted 12 storks wheeling overhead, a sight to behold. The Café was also the venue for a couple of poetry readings where we got to hear the strong and varied voices of the different participants. We were extremely lucky to have Gérard Noyau with us throughout. He translated some of our poems into French and it was fascinating to experience the translation process and be able to perform one of my poems in a different language. Gérard’s father was René Noyau, the celebrated Mauritian surrealist poet, and he performed some of these poems too, with Peter reading the English translations which he and Gérard have been working on so meticulously. 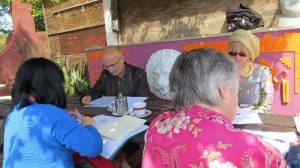 The Café was also the venue for a great workshop with Manuel Neto dos Santos, a Portuguese poet with eight collections to his name. We listened to him read one of his prose poems and then roughly translated it with his help. Once we had the bare bones we were able, in groups, to transform it. Our aim was to make it sound as poetic as possible and as close to Manuel’s vision as we could. It was a magical exercise and gave us all a real insight into the translation process, notoriously tricky when it comes to capturing the essence of a poem. One of my recent discoveries is a collection of Moniza Alvi’s translated versions of Jacques Supervieille’s poems, Homesick for the Earth. She spent literally years working on each version and they are beautifully crafted. I find the whole question of poetry translation fascinating, including the question-marks over who has created the poem as the translator is often transforming ideas into words which are impossible to literally translate and adding their poetic voice into the mix. I realised, to my shame, that not only were my language skills being sorely tested (I could read a little Portuguese thanks to a knowledge of Spanish, but the pronunciation was a real challenge) but I also knew nothing about the country which was hosting me so graciously. At one point we had a talk from a longstanding local resident and headteacher about what it was like to have been a young man during the final days of the Salazar dictatorship and the Carnation Revolution of 1974, the anniversary of which had just taken place as we arrived in Portugal. Someone who lived through the early days of Salazar’s regime was Fernando Pessoa and, towards the end of the course we had a fascinating study day on Pessoa, led by Manuel Portela from the University of Coimbra. As well as being a superb linguist, translator, poet and scholar with wide-ranging academic interests and qualifications, Manuel is an expert on digital literature and is creating an interactive, multilingual, digital archive of Pessoa’s The Book of Disquiet which will eventually include creative responses to Pessoa’s writing. This means you’ll be able to enter the archive as a reader, writer, editor and translator. We were the guinea pigs for the writing phase of the project, taking phrases from some Pessoa extracts and using them as a launching pad for our own pieces. I did not know Pessoa’s work before and it opened up a whole new world for me. Pessoa wrote under his own name, but also used approximately one hundred and thirty six other names of which several were fully developed heteronyms, including Alberto Caeiro, Ricardo Reis, Álvaro de Campos, Barão de Teive, António Mora, Vicente Guedes and Bernardo Soares. Heteronyms are an extraordinary concept, behind these names were fully-imagined authors, each with a distinctive voice, persona and opinions. He began creating these heteronyms from a very young age. 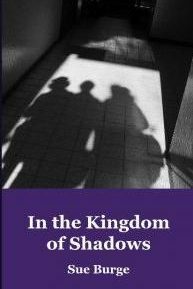 The Book of Disquiet is a fragmentary project, it has no narrative, each text begins in the concsciousness of the moment and much of it was written in cafes by Bernardo Soares, one of Pessoa’s heteronyms. Manuel’s digital version of the book means that it can be read in different ways which reflects how the book was discovered – pages and pages of disordered and fragmented writing in a trunk! 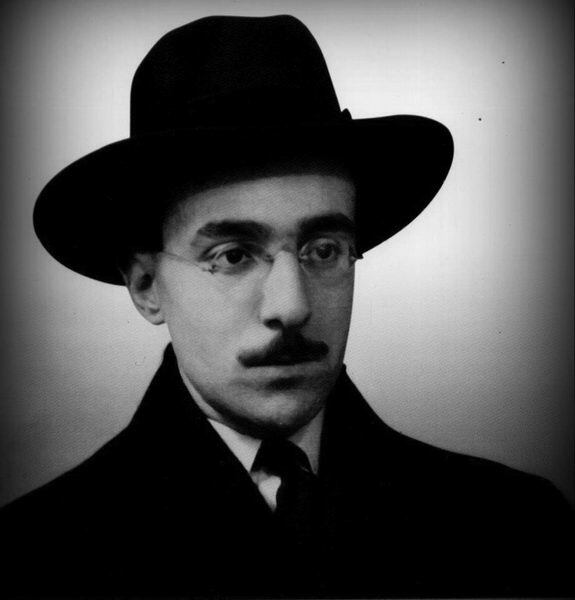 Pessoa’s life, interests and writing could fill pages and he only lived to the age of 47! A mysticist interested in astrology, the occult, Neopaganism, rosicrucianism, theosophy, the list goes on. Pessoa spent some time in South Africa as a child and was fluent in English. He once dreamed of becoming an English poet in the romantic tradition. Our venue for Manuel’s workshop was the Quinta da Eira where five of us were fortunate enough to have been staying for the whole course. 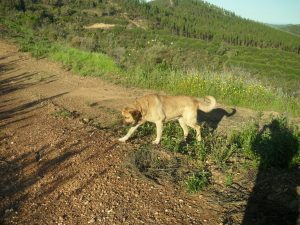 This solid farmhouse, around 9km from Silves, with its resident dogs and cats and beautiful terraces overlooking the hillsides and lake was like staying in a living postcard. I got out and about as much as I could into the surrounding countryside, walking, thinking, taking photos. Whenever we went out for walks one of the farmhouse dogs would accompany us. Peter and Andrea led some brilliant poetry workshops on voice and persona which helped enormously with the Pessoa study day and were very thought-provoking. I also led a workshop one afternoon, designed to take participants out of their comfort zones and, despite the fact that we were on the lovely terrace at Quinta da Eira with distracting views in the sunshine, everyone rose to the challenge magnificently! All in all, a stunningly successful venture and my brain is still trying to process everything we learnt. 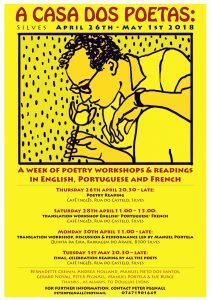 What has stayed very much in my mind is that, apparently, poets in Portugal are revered and respected, quite right too! Pedestal over here please! Sue will be featured poet alongside Heidi Williamson at the Sitting Room Cafe, Augusta Street, Sheringham on Wednesday, 17th April. 7pm for a 7.30 start. Open mic slots also available at this convivial evening hosted by Peter Pegnall. All welcome! writing course or a mentoring session as a gift? Contact Sue for more details. A BEGINNING, A MUDDLE AND AN END! the bag searchers at the doors. higher than I can tilt my head. layered and extravagant as wigs. unfinished, a whole age lost under a falling blade. raining down on my pretty neck. bedroom wallpaper sagging under the weight of his face. hay blonde hair, eyes as blue as her new spring dress. jaunty casquette, worn trousers pulling at his lean bones. like in Le Jour Se Leve as Arletty looks on. her body glowing like a miracle. that gives him his only true voice. his photo, creased and cracked to anonymity.